Hi, my name is Rodney Schram, and I am a rider of a TerraTrike Zoomer. 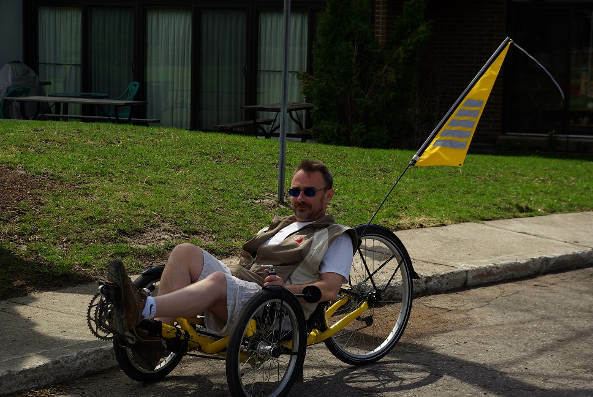 My interest in the recumbent tadpole trike has been ongoing for over a year now and it wasn’t until the opportunity to purchase this trike became available, that I have come to realize just how much I was missing. I was told my trike is a 2008 and the price was the remarkable factor, $600. It was from a motivated seller who had moved out of province and was selling 4 Paths and this Zoomer. The Cateye velo that came with it had an odometer reading of under 500km and I have no reason to believe there were many more kilometres ridden on this trike. I replaced the original tires due to a flat on one of the originals, a piece of chord inside the tire had pricked the tube and would have continued doing so, so I opted for new tires, a larger, higher-pressure tire. I live in London, Ontario and Schwalbe tires are unheard of around here, so I purchased ASM Animals, a tire made for the BMX crowd. They are quite slick, made for the road and 110psi potential. Aside from getting easily dirty, they are a great tire. I put 1.9” on the front and 2.1” on the back and wow… does this thing roll!!! I have been riding bicycles for most of my 54 years. The wrists, back, neck … you know the story…. it just wasn’t a fun thing to do anymore. I have many kilometers on my Zoomer now, and love every minute of riding it. I can be out for several hours at a time without any stresses to my body. This will be my commuter, pleasure vehicle, as I do not drive cars, trucks, buses or anything else that involves $$$$ on a daily, weekly basis. 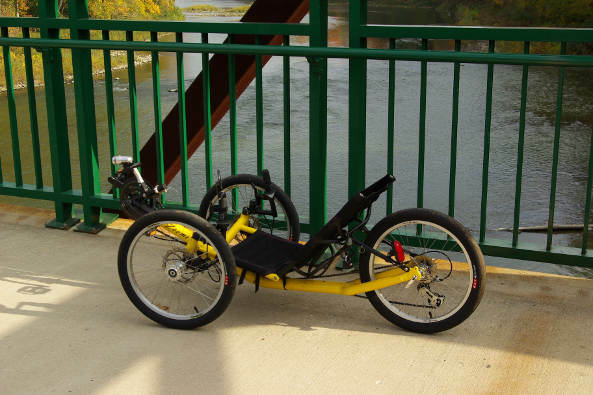 I have every intention to open a business selling and servicing recumbent tricycles in my city. I have been working on this idea for a while now, and when the finances become available, it will happen. The stares, the thumbs up, the questions and interest from others just reinforces my commitment to get my business rolling. A few changes include the 26″ rear wheel, new chain ring and crank, cassette, chain, bar-end shifters, rear dérailleur and cables, 3 wheel fender kit, right mirror, magic shine front and rear lights. and a purple sky flag. I will be looking into new pedals (undecided which ones). I usually follow the river along the MUP in London and I met a fellow rider who was test riding a Giant bicycle from a local bike shop. He stopped, asked me question upon question about my trike and trikes in general. 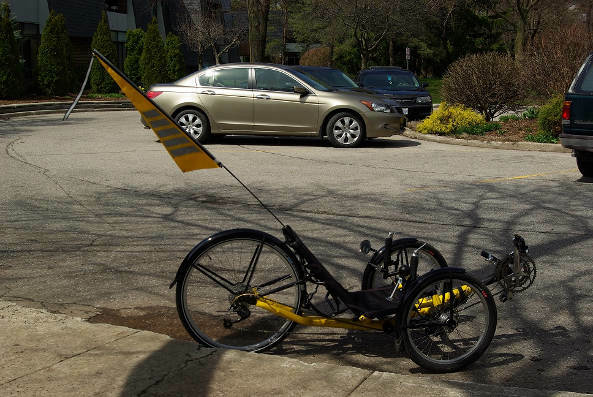 It was great to express my interest in recumbent trikes. By the end of our conversation, we exchanged numbers and he had the idea I could be his consultant, possible mechanic/assembler should he purchase a trike. I have no idea if our conversation killed a possible bicycle sale yesterday. We do not have any access to trikes in London, hence my business plan … that’s another story. I find that every time I am riding, I am always stopped and asked questions, at the very least a wave or a “cool bike” comment from half a dozen people.